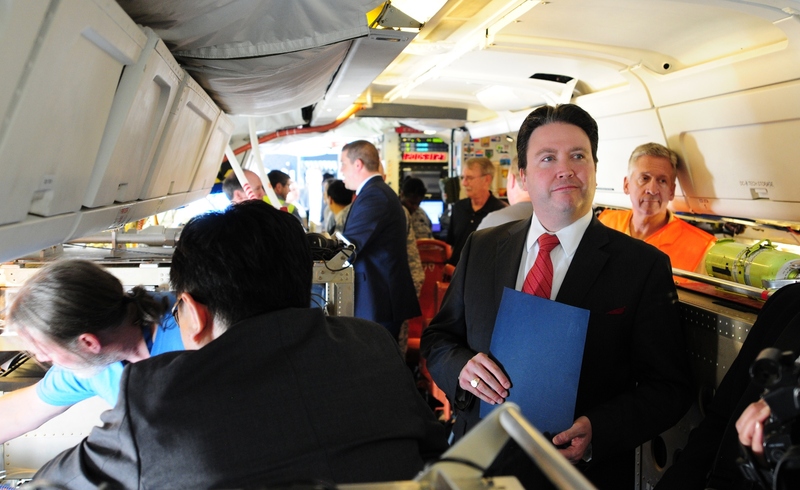 On Friday April 29, over 100 guests and media attended the official kickoff of the Korean US Air Quality (KORUS-AQ) field experiment at Osan Air Base near Seoul. The event included talks about the project and tours of the three KORUS-AQ aircraft: the NASA DC-8, NASA King Air B-200 and the Hanseo King Air B-200. 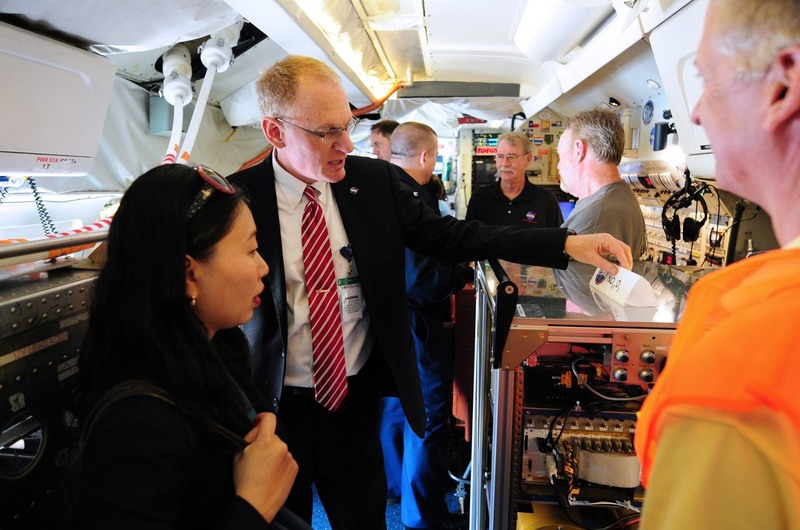 Pilots, navigators, scientists, engineers and technicians answered questions about the science of the mission and the technical aspects of using aircraft to study air quality. Dignitaries attending the event included Marc Knapper, Deputy Chief of Mission for the U.S. Embassy, President of the National Institute for Environmental Research (NIER) Jin-Won Park, NIER Director General Jihyung Hong and Ministry of the Environment Director General Jung-Kyun Na. About 50 NIER guests also attended to learn about the mission that will be taking place in South Korea over the next six weeks. You-Deog Hong, Director of the NIER Air Quality Research Division and KORUS-AQ mission scientist Jim Crawford of NASA Langley Research Center gave a presentation about the mission. KORUS-AQ flights are expected to begin as early as Monday, May 2. 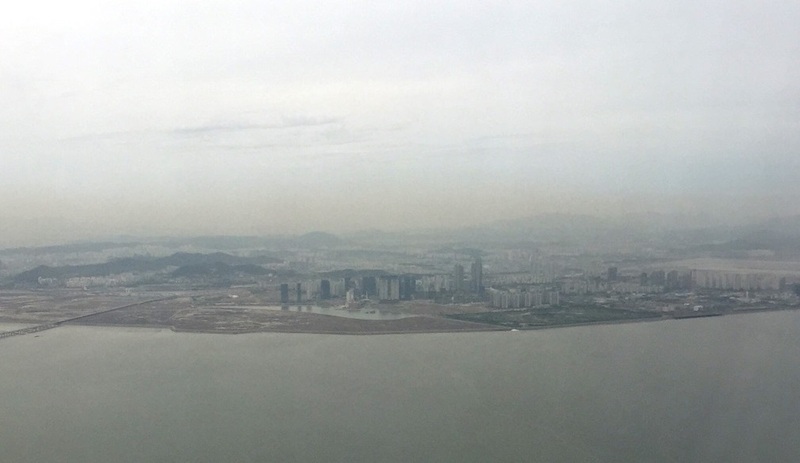 Looking out the window while descending toward Incheon International Airport near Seoul, earlier this week, I couldn’t help but notice the hazy, yellowish brown layer covering the city. For several days before the flight, I had been using various apps, websites and Twitter feeds to track air quality in the megacity. Now there it was, that layer of smog, at the end of a long transpacific flight. 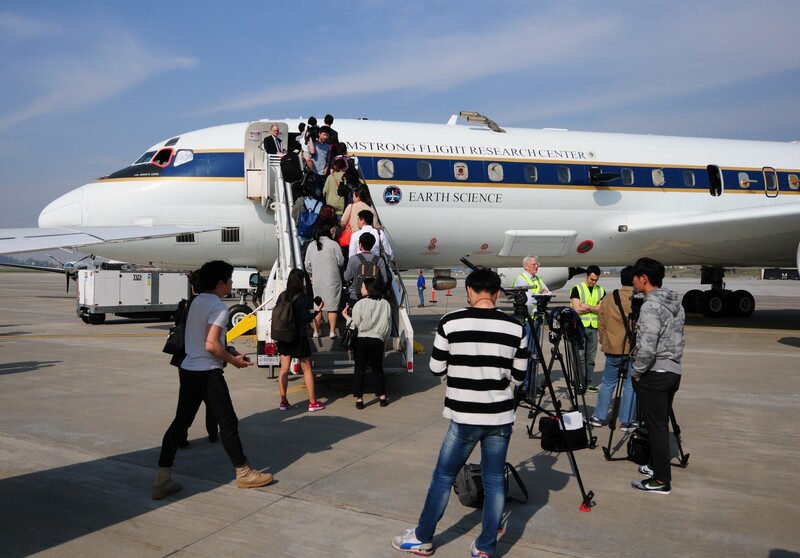 Understanding air pollution in South Korea was the reason that I and over 100 scientists, engineers, pilots, students, and other NASA personnel were flying from around the world to Seoul this week. 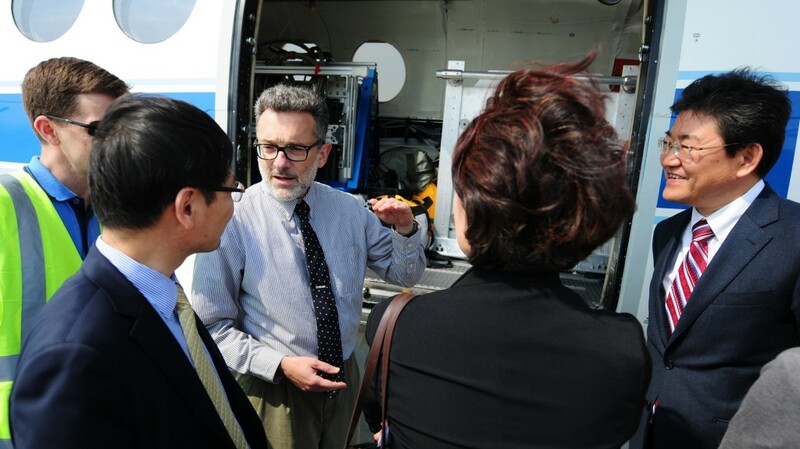 Our mission: the Korean US Air Quality Study (KORUS-AQ), a collaboration between NASA (where I work) and the Korean National Institute for Environmental Research (NIER). But why is NASA studying air pollution in South Korea? In order to understand what makes this country an ideal natural laboratory for air quality studies, you need to understand what contributes to poor air quality around the world. Two of the main factors are particle pollution and ozone gas. Particle pollution is made up of small particles and liquid droplets suspended in the air. These airborne particles can form in a variety of ways. They include smoke from fires and dust as well as particles formed by emissions from cars, power plants and other industrial activities. Breathing in these small particles allows them to enter the lungs where they can cause damage, including health effects such as heart and lung disease and even lead to premature death. Ozone gas is another big air quality concern. While ozone gas located high in the stratosphere protects us from the sun’s harmful UV rays, pollution from cars and other human emissions near ground level can cause chemical reactions that lead to ozone formation near the surface. Breathing in high levels of ozone is also bad for human health, causing lung diseases and health impacts on sensitive populations such as children, the elderly and people with asthma. Peak ozone in Korea occurs between April and June. Since Seoul is located on a peninsula, the metropolitan area and the pollution produced here are separated from other sources of emissions. In addition, Seoul’s human-produced emissions are concentrated in its urban areas but are surrounded by more rural agricultural areas. The contrast between urban and rural zones on the peninsula allow scientists to study and differentiate human and naturally-produced emissions and better understand how they interact chemically. Understanding the chemical reactions between urban and agricultural emissions is critical extremely important for improving models that forecast air quality. In addition to locally-produced pollution, Seoul is downwind of pollution blowing into the country from far away. Megacity pollution, smoke from seasonal fires, and desert dust all blow onto the Korean Peninsula from other parts of East Asia. KORUS-AQ research aircraft will fly routes off the west coast of South Korea, over South Korea, and off the east coast to sample air moving to and from the Korean Peninsula. Data collected along these flight paths will allow scientists to better understand how local and distant pollution interacts chemically over the Korean peninsula. April-June is the period of strongest influence from upwind pollution sources blown into the country, including dust outbreaks and biomass burning. KORUS-AQ also benefits from the Korean Geostationary Ocean Color Imager (GOCI) satellite, now in orbit for over five years, providing hourly particulate matter observations over Asia. The airborne measurements from KORUS-AQ provide a unique opportunity to check the accuracy of this geostationary air quality satellite. The data will also aid development of new satellites that NASA and South Korea plan to launch in the next few years. The Korean NIER Geostationary Environment Monitoring Spectrometer (GEMS) and NASA’s Tropospheric Emissions: Monitoring of Pollution (TEMPO) instruments will provide unprecedented satellite observations of air quality over East Asia and North America, respectively. Despite regulatory efforts aimed at curbing emissions over the past ten years, Seoul frequently experiences poor air quality from both ozone and particulate matter. Air quality in Seoul can be so bad at times that residents are urged to avoid exercising outdoors, wear masks when outdoors, or even avoid going outside entirely during extremely bad air quality days. The colorful lights on the top of N Seoul Tower – the highest point in the city alert Seoul residents to the amount of fine particle pollution in the air they are breathing. At a certain time of day, if the lights on the tower are blue it means Seoul is experiencing good air quality (less than 45 micrograms of fine dust per cubic meter of air) indicating to residents that it is safe to walk, play, or exercise outdoors. The air quality information is tweeted automatically every hour by @yellowdust. Anything below 45 micrograms per cubic meter of particulate matter is considered good air quality. 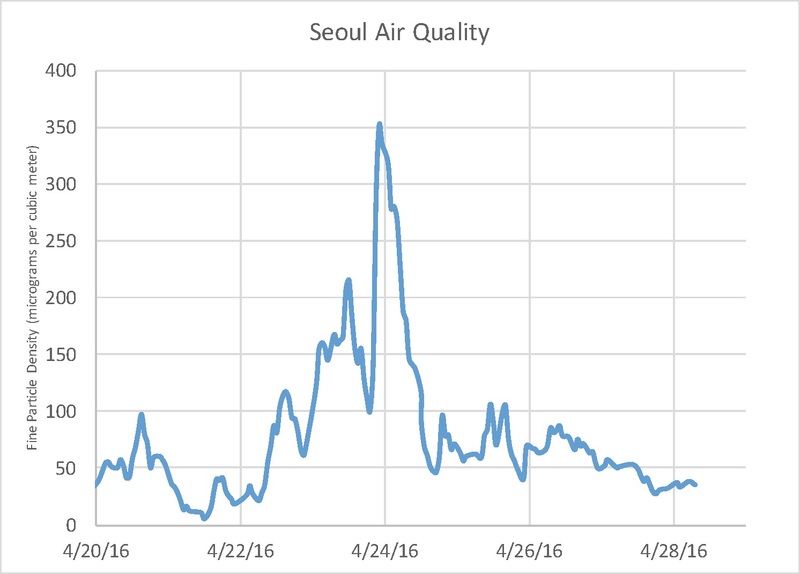 Seoul’s particulate matter on April 24 spiked to nearly 8 times that amount. 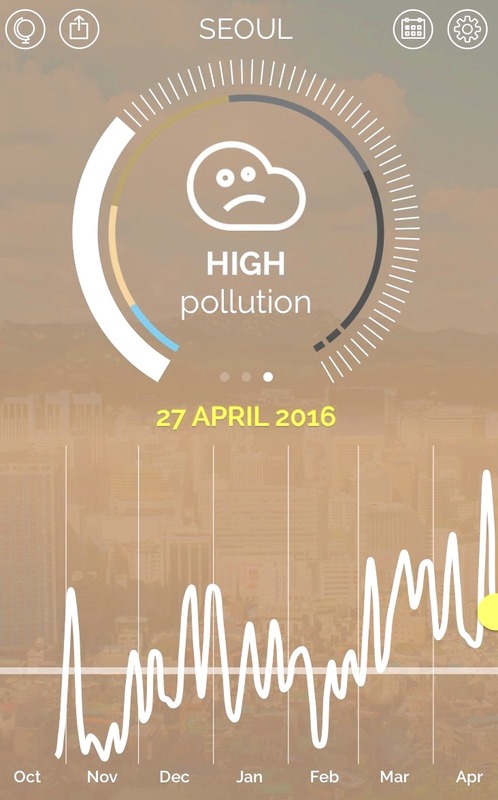 Just a few days before my flight to Seoul, @yellowdust showed a rapid spike in bad air quality in the city. Data geek that I am, I couldn’t help but plot recent @yellowdust data (see plot above). I was amazed by the rapid spike from relatively good to extremely hazardous air quality in less than a day. 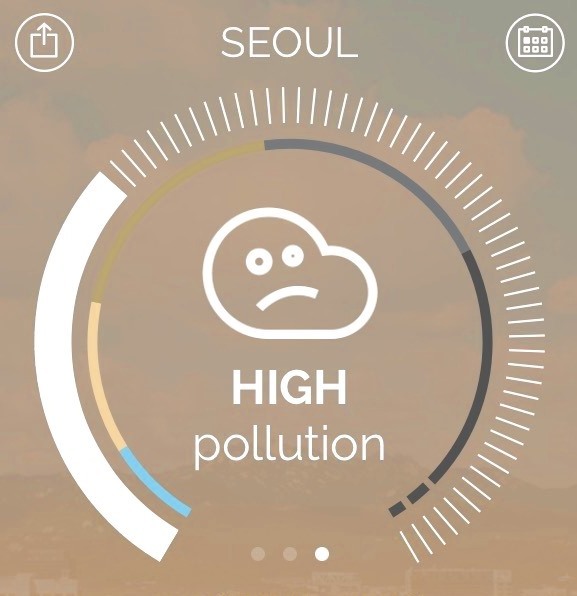 Taking both ozone and particulate matter into account, the Plume Labs app (below) shows that Seoul is currently experiencing some of its worst air quality of the year so far. It is no accident that NASA is here in South Korea now to experience it. The KORUS-AQ mission planners specifically picked this time of year so that the instruments on our airplanes could measure Seoul air quality at its worst. In the future, this information will be used to help address air quality problems here and around the world. They met at an air quality-monitoring site near downtown Seoul over a decade ago. 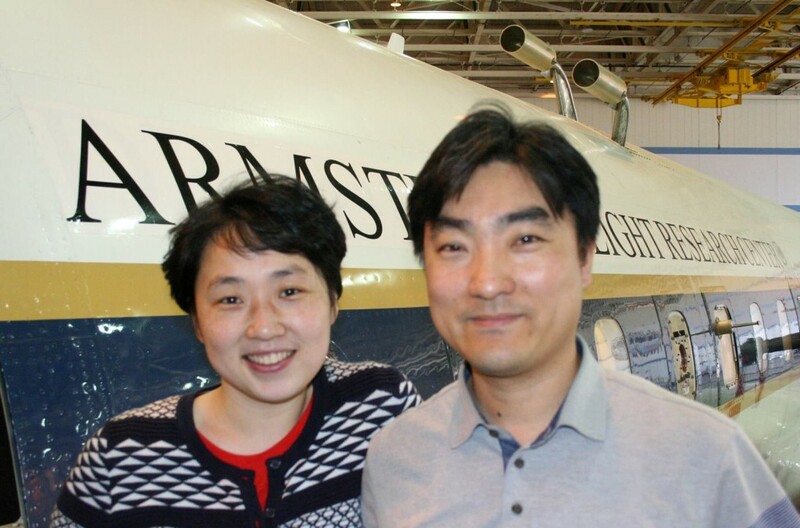 Now the husband-and-wife team of atmospheric chemists are working together on the KORUS-AQ field experiment that gets underway this week in South Korea. Jeong-Hoo Park is the lead Korean scientist for KORUS-AQ and senior researcher at the National Institute for Environmental Research in Seoul. Kyung-Eun Min, assistant professor at the Gwangju Institute of Science and Technology, leads the K-ACES instrument team participating in KORUS-AQ. 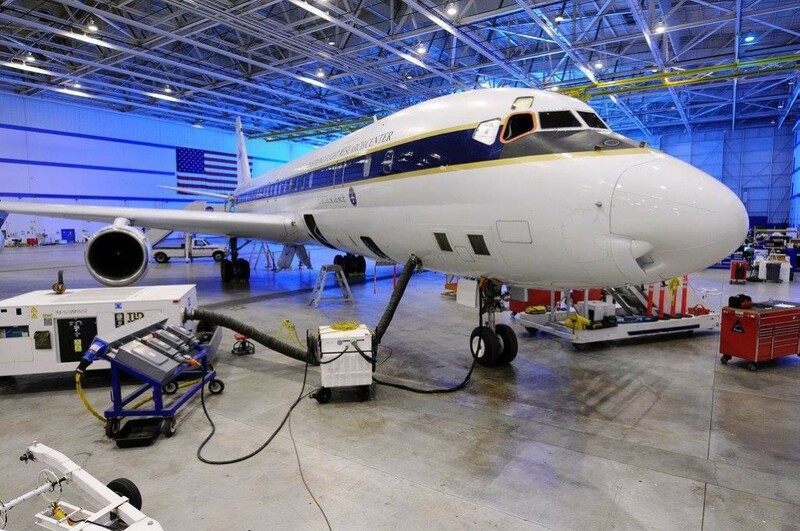 We caught up with the couple last week at the Armstrong Flight Research Center Hangar 703 in Palmdale as they checked out instruments being installed on NASA’s DC-8 flying laboratory. What are the big goals of the KORUS-AQ mission? Jeong-Hoo Park: The first is to inventory South Korea’s emissions. The second is to study the mechanisms that control air pollution in Korea and then create an efficient strategy to improve air quality using policy. The third goal is to improve the country’s air quality forecasting system. The last is to validate sensors and algorithms for a satellite called Geostationary Environmental Monitoring Spectrometer (GEMS) that will monitor air quality from space after it launches in 2019. The satellite will be identical to NASA’s planned Tropospheric Emissions: Monitoring of Pollution (TEMPO). Can you describe a particularly bad air quality day that you’ve experienced while in South Korea? Kyung-Eun Min: I was living in California during my PhD program and went back to visit my mom in South Korea during May. I was hanging out with family, and I looked at the sky and noticed it was gray. It was like that all day long. I said to my mom, “Oh it looks like it’s going to rain soon, but it’s not going to rain.” My mom responded. “No, it’s very sunny today! It’s sky blue!” I said, “No, can’t you see that it’s overcast and gray?” That was the first time I ever realized the daily air quality contrast between Korea and the U.S. Does South Korea have a warning system to alert its citizens of a bad air quality day? KEM: When I was in graduate school they only had an alert warning for Asian dust events. These days there is also a pollution forecasting and alert system. JHP: Yes, we have an air quality forecasting system that is managed by the National Environmental Institute of Research and gives a next-day forecast to the public every day via the news networks. The system warns the public so that they can be better prepared and wear a mask if needed. Jeong-Hoo, how did you get involved and eventually co-lead the KORUS-AQ mission? JHP: Before working on KORUS-AQ, I worked at National Center for Atmospheric Research in Boulder, Colorado. One day I heard about the mission there and was intrigued, so I decided to move back to Korea to manage the mission about a year and a half ago. 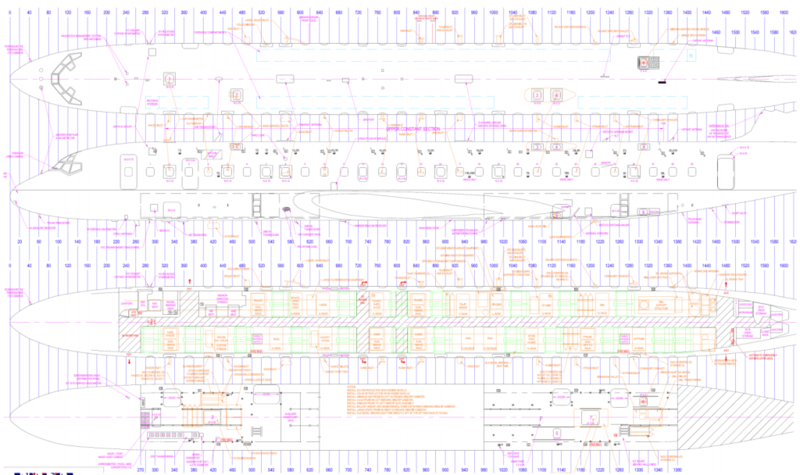 What has been the most challenging part of planning the KORUS-AQ mission? The most rewarding? JHP: The most challenging part of planning was gaining consensus between all of the different organizations. 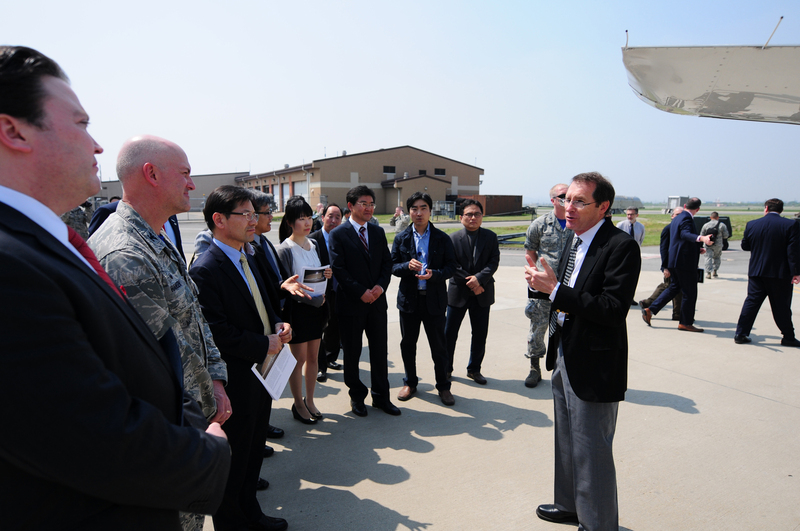 For example, I had to convince the Air Force and related organizations for support of the project. KEM: The most rewarding part is the opportunity to have the mission take place in South Korea. We have never had such a large and complex mission in our country. It is also rewarding to share this opportunity with our students and let them see how we collaborate and how important our work is. What first got you interested in this area of research? JHP: When I was an undergraduate student, I took an air pollution class. I saw that there were a few chemical reactions with some equations that expressed a phenomenon in the air and I was very interested in that because it actually expressed things that are invisible to us. I was so excited and I jumped right into it. KEM: I’ve always liked atmospheric research because it deals with a global issue. Air doesn’t have any social borders. If something major happens to the air in one country, it crosses to other countries so easily and quickly. JHP: I went to Yeungnam University in Korea for my undergraduate degree and went to Korea University to study atmospheric chemistry. I went abroad to the United States to the University of California, Berkeley and graduated with my PhD from the Environmental Science Policy and Management Department. KEM: I went to Korea University for both my bachelors and masters science programs in atmospheric chemistry. I went on to UC Berkeley for my PhD and did postdoctoral work at NOAA. Did you meet at UC Berkeley? KEM: In a field mission in Korea. JHP: Fourteen years ago, we met at the field site, which is the same as one of the KORUS-AQ ground sites. KEM: We met when we were in different groups at the Olympic National Park, which was a ground site for another air quality field study but also one for KORUS-AQ. We started to date each other secretly. Then we ended up pursuing our PhDs together at UC Berkeley. So there was some luck to it, too. Is there any professional competition between you as husband and wife? JHP: Well, I will say that we are kind of a synergetic couple because the measurements from our instruments are complementary. KEM: People think we are a good couple so we are good colleagues, and usually we are. When I did nitrogen oxide studies in graduate school, he was studying volatile organic compounds (VOC). They are good ingredients for trying to understand ozone pollution and complex chemistry, and we collaborated well during that time. Now I’m starting to look at oxygenated VOC’s, so I’m very eager to get his data and analyze it. Sometimes we sit down to have a discussion about the data and come to a point where we have slightly different perspectives, so then we argue sometimes. JHP: There is no competition. Do you typically talk about science at home around the dinner table? KEM: Some couples that work in the same field will not talk about work at home, but we are not like that. We discuss whatever we want. Sometimes it’s about the science. Sometimes it’s about personal life. KEM: We have one son, who is seven months old. Do you want your son to go into the air quality research field? KEM: Interesting question. We’ve talked about it a lot. In Korean culture, parents expect a lot of their offspring. If he chose atmospheric science as his field of interest then we would probably be very happy, but we don’t want to pressure him into going that direction. JHP: I agree. I want him to do anything he wants to do. How will this research help people today and people in the future? JHP: I hope that the success of the KORUS-AQ mission will provide data that will lead to better emission policies and the best air quality for the next generation, including my son. I hope it will also help further develop the Korean atmospheric research community and push us towards doing more air quality research studies. 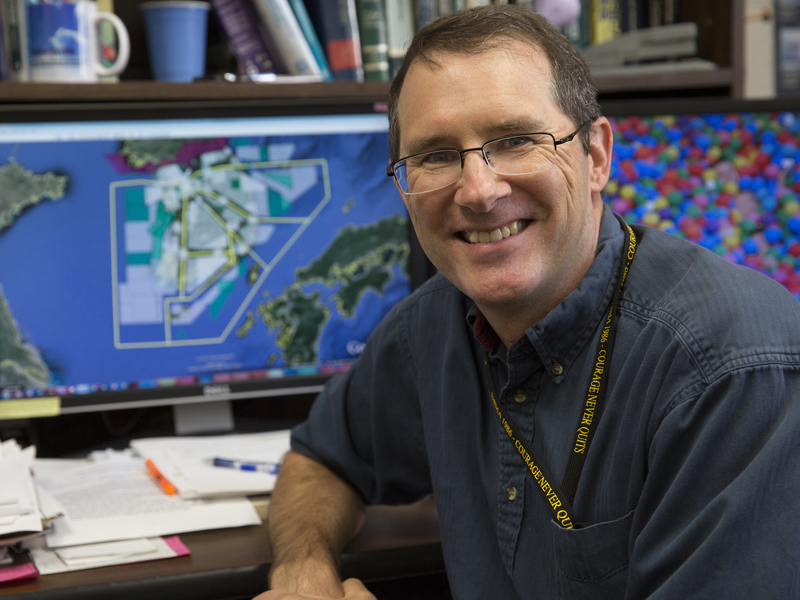 A few days before leaving for South Korea and the start of the Korea U.S.-Air Quality study (KORUS-AQ) field campaign, lead U.S. project scientist Jim Crawford, 52, from NASA’s Langley Research Center in Hampton, Virginia, answered a few questions about the mission and his career studying air quality around the world. How long have you been involved in air quality work? I have been conducting research in atmospheric chemistry for just over 25 years, but much of my early work was on the remote atmosphere. My focus on air quality and conditions in urban areas has only been over the last five years. I entered graduate school at Georgia Tech in 1991 after five years of active duty in the U.S. Army. To be honest, I was looking for something new and interesting to pursue, and atmospheric science was what caught my eye in the college catalog. I have not regretted what may seem like a whimsical decision. Can you describe a particularly bad air quality day that you’ve experienced? Poor air quality is not always obvious to the naked eye, but during a visit to Beijing in 2012, the conditions were so bad that you could not see more than a block down the street. I do not have any allergies, so I am not particularly susceptible to respiratory problems. Even so, I got sick on that trip, and I wonder how much the poor air quality contributed. How does KORUS-AQ compare to other air quality projects you’ve worked on? I have been involved in many large field experiments, and KORUS-AQ certainly belongs in that category. I have also experienced a lot of complexity over the years. While the flights in Korea will not be the most complex that I have ever planned, the airspace over Korea is quite challenging to navigate and the international coordination has gone far beyond anything we have attempted in the past. Where else in the world have you done air quality field work? I have participated in research flights all over the world and in many different types of aircraft. Much of my early career was spent working on airborne studies over the remote North and South Pacific and along the Asian Pacific Rim, looking at long-range transport of pollution. I have also participated in aircraft flights over Antarctica as well as the Arctic, so my experience has spanned the globe. It is only in recent years that I have become engaged in flights over populated areas where human emissions and poor air quality occur. What has been for you the most challenging part of planning KORUS-AQ? The international coordination and negotiation of flight permissions has been a tremendous challenge in the preparation for KORUS-AQ. Never before have we worked so closely with colleagues in another country, nor have we attempted to fly in such busy airspace within the borders of another nation. We’ve built enduring relationships. Airborne observations are sparse, and KORUS-AQ will expand our capability as an international community, leading to better quality and coverage for atmospheric observations to understand air quality, which has become a problem of hemispheric scale. How do you hope your work will benefit people today or in the next generation? Our work brings attention to the impacts of human activity on Earth. For today, people need reliable forecasts of air quality, and for tomorrow, they need effective policies to improve air quality. Hopefully, this work adds to the motivation to continue developing and transitioning to energy sources that are free of harmful emissions to the atmosphere. These emissions are the root cause of both poor air quality, which is a short-term impact, and climate change, which is a long-term challenge. 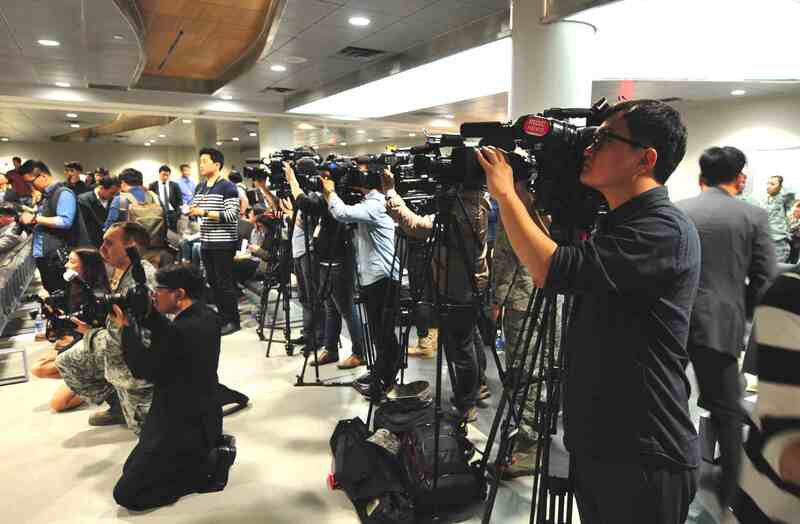 There are many layers to orchestrating a mission as complex as the Korean U.S. Air Quality (KORUS-AQ) study, which gets underway next week in South Korea. Preparing the aircraft and science instruments to come together as one is just a single layer, but it’s an extremely important one for ensuring a safe and successful mission. 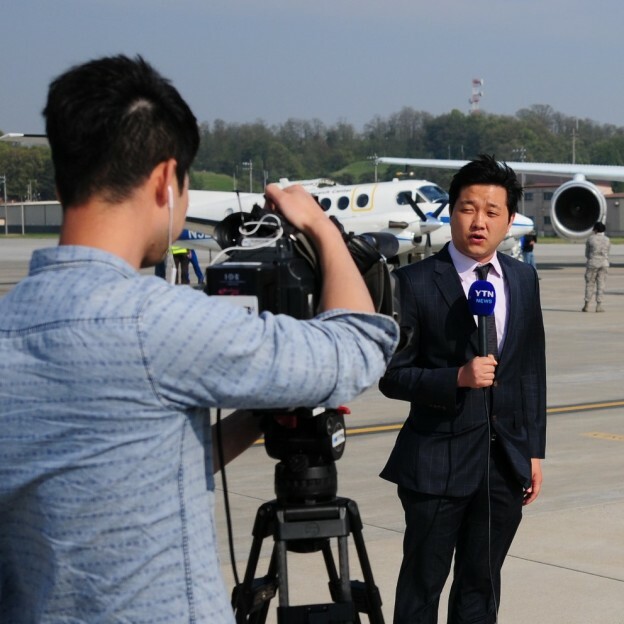 KORUS-AQ, a joint field campaign by NASA and South Korea’s National Institute of Environmental Research, will combine observations from aircraft, satellites, ships and ground stations to assess air quality across urban, rural and coastal areas of South Korea. These data will help shape the development of the next-generation system of space- and ground-based sensors for air quality monitoring and forecasting. 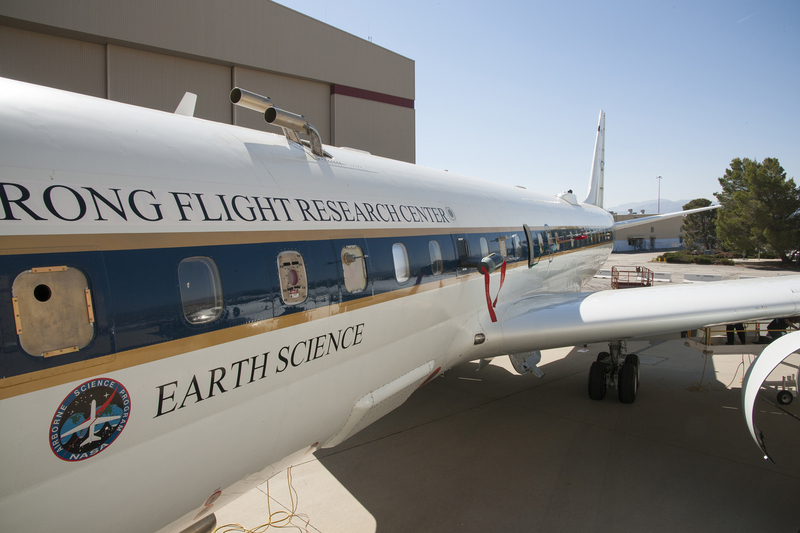 NASA’s DC-8 flying laboratory looks like a normal passenger jet, but it’s far from it. The highly modified aircraft has removable seats, ports and windows. The onboard electronics have also been modified to support a variety of instruments. Despite the many “holes” in the aircraft, the structure is highly stable. Instrument integration work began a month prior on March 21 when the instruments were shipped to the science lab at Armstrong Flight Research Center’s Hangar 703 in Palmdale. Some of the instruments arrived in pieces and had to be built from the ground up before they were installed. Others arrived fully assembled and only needed to go through power and other system checks before they were ready for installation. 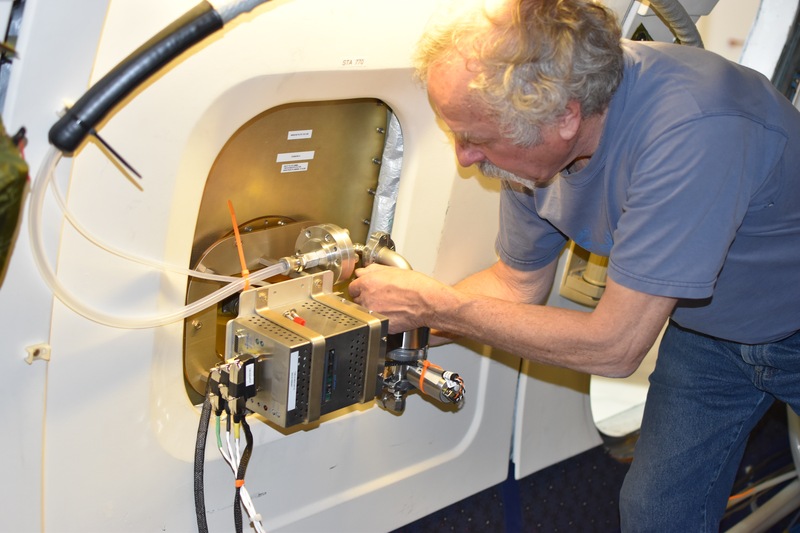 Before loading instruments into the plane, DC-8 quality inspector Scott Silver inspected each of the instruments for “air worthiness” in the science lab. He made sure that each instrument did not emit sparks or smoke or create other hazards that could potentially cause problems during flight. “Once the instrument is on the plane, it’s not coming off. But we need to make sure it’s safe before we even get to that point,” Silver said. While the scientists made sure their instruments were functional, aircraft mechanics removed windows on the aircraft and installed a wide variety of air intake probes. They also installed optical ports into the top and bottom of the plane for laser sensors. After port installation was done, the aircraft looked somewhat like a porcupine. Each instrument was then rolled out of the science lab and placed on a large scale to be weighed for aircraft weight and balance requirements. From there, each instrument was loaded onto a lift and carried up to the aft doors of the aircraft. This part was tricky. 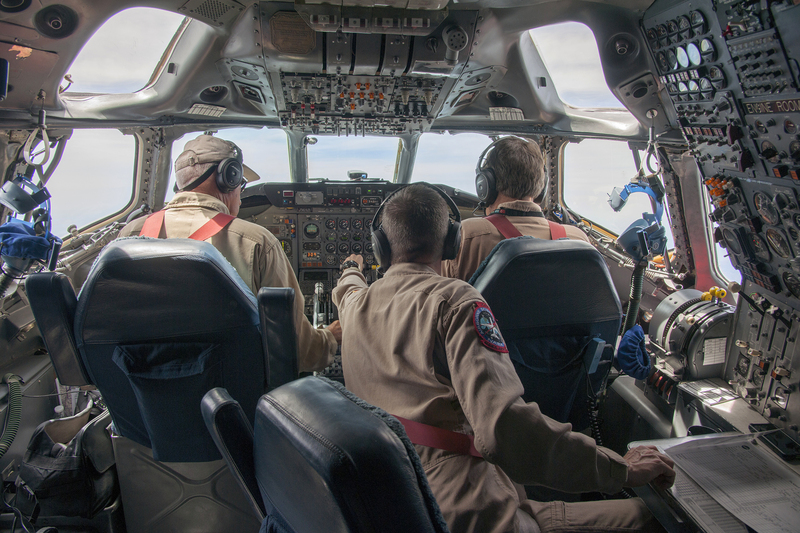 Cabin space is limited and the payload of 26 instruments is large compared to most DC-8 missions. So instruments had to be loaded in a specific order, starting with the instruments located at the front of the plane. Mechanics, avionic techs, data system engineers, and experimenters worked side-by-side to install each instrument without causing delays to the 10–20 instruments in the queue behind them. 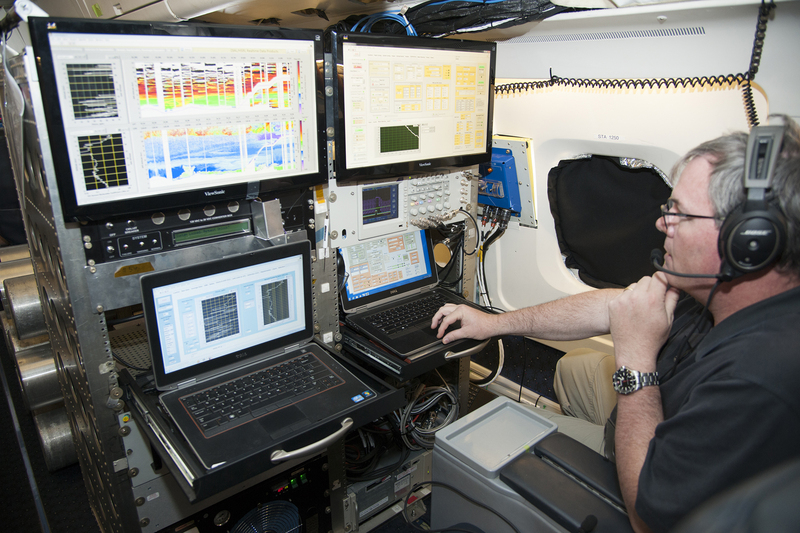 The experimenters were then free to make sure their instruments were working and communicating with the onboard data system. After installation, the aircraft was moved outside of the hangar to allow the experimenters to calibrate the instruments. The aircraft was then turned back over to the DC-8 crew who performed necessary aircraft maintenance checks on the engines and cabin pressure. “Our primary job at NASA Armstrong is to make sure that all of the experimenters onboard are safe and can focus on collecting as much data as possible,” DC-8 crew chief Corry Rung said. The final checks happened throughout several short flights. The first on April 15, called a “shake flight,” ensured that none of the instrument hardware was loose and that they all functioned correctly. 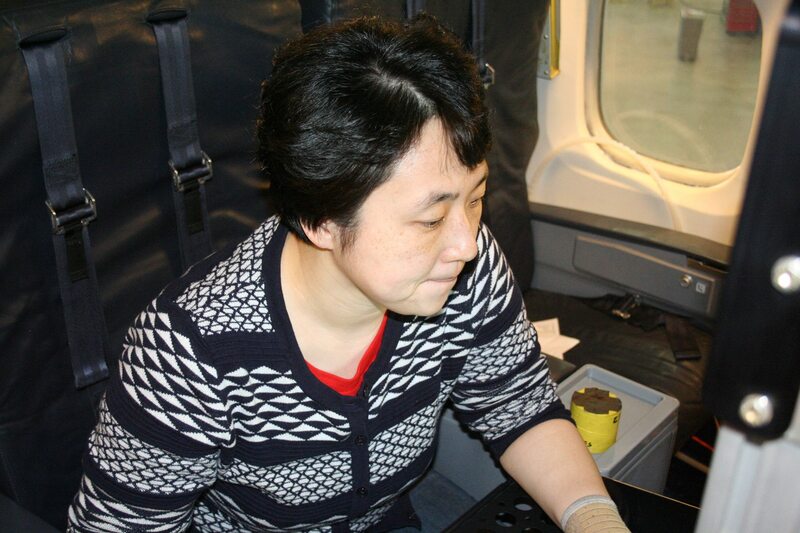 The second two flights on April 18 and 22 were devoted to testing the science instruments themselves. The DC-8 is slated to leave California for Osan Air Base on April 26. Meanwhile across the country at NASA’s Langley Research Center in Hampton, Virginia, the UC-12B King Air was going through a similar integration process. However, because the King Air has a smaller fuel tank and payload capacity, the aircraft cannot make the transit flight across the Pacific with all of the instruments on board. After the science instruments were installed, fitted and checked, they were quickly uninstalled and packed into shipping boxes headed to Osan Air Base. The aircraft was then outfitted with large fuel bladders that will help the aircraft to make the long transit flight. The fuel bladders will be stored inside the aircraft fuselage. Once the King Air aircraft arrives, the crew will reintegrate the science instruments just before the field campaign begins. The King Air departed Langley Research Center on April 18 and will make stops at Ames Research Center in California, Anchorage, Alaska, Adak Island (Aleutian Islands) and Kadena Air Base in Japan. The aircraft is scheduled to arrive at its destination at Osan Air Base on April 25.